This article is about instant noodles brand sold in a cup. For Nissin's cup noodle brand, see Cup Noodles. In 1971, Nissin introduced Nissin Cup Noodles, a cup noodle to which boiling water is added to cook the noodles. A further innovation added dried vegetables to the cup, creating a complete instant soup dish. Cup noodles are known as keop-ramyeon in South Korea. Popular cup noodles include Nongshim's Bowl Noodle Soup, Shin Cup Noodle Soup and Samyang's Hot Chicken Flavor Ramen. Cup noodles were introduced in 1990 by Maruchan. Due to its popularity, instant noodles are often referred to simply as "Maruchan". Today, many local brands such as "La Moderna" and "Herdez" have developed their own cup noodles, along Nissin, which is also a newcomer. Brands available in the Philippines include Lucky Me, Payless, Nissin, QuickChow, Maggi and Ho-Mi. They are sold in packets, sealed paper cups, or sealed foam food containers. Cup noodles are usually sold for 10 SEK per package. 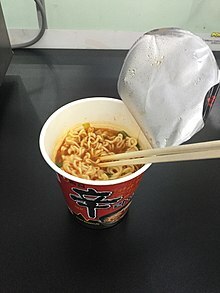 A common form of instant noodles in Britain is Pot Noodle, a cup noodle first marketed by Golden Wonder in 1977, and acquired by Unilever in 1995. These use artificial flavorings and are generally suitable for vegetarians (there is no chicken in Chicken Pot Noodles, for example) and are sold by virtually every major supermarket chain, general groceries shops, and convenience stores. Boiling water is added to the noodles to cook them. In 1972, Nissin Foods introduced "Nissin Cup Noodles" in a foam food cup, which led to an upsurge in popularity. Soon after, many other competing companies were offering similar instant noodle products. ^ Lee, Hai woon (27 June 2013). "Korean Cup Noodles Served on American Airlines". The Chosun Ilbo. Retrieved 23 April 2017. ^ Kajimoto, Tetsushi; White, Stanley (17 May 2016). "Sucked into deflation again - Japan's $2 cup noodle binge is sign of the times". Reuters. Retrieved 23 April 2017. ^ Arguillas, Carolyn O. (15 April 2017). "Wao parish priest appeals for tents, water for quake-affected residents". MindaNews. Retrieved 23 April 2017. ^ Chan, Samuel (23 April 2017). "Wait for share prices to be right, then buy and hold". The Straits Times. Retrieved 23 April 2017. ^ 김, 지윤 (30 May 2017). "육개장 사발면의 포효… "컵라면 王, 바로 접니다"". Herald Business (in Korean). Retrieved 27 July 2017.